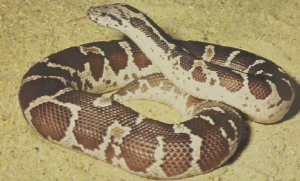 The deserts and plains of western Asia are the home of the burrowing ground boas that preferentially feed on rodents and lizards and spend most of their life underground. These snakes, which are 2 to 4 feet long, may be identified by their very short, conical tail and perfectly cylindrical body. Their habitat ranges from desert regions of Iran to the moist plains of southern India, with the desert species capable of surviving for months without drinking. In the agricultural areas of southern India these snakes are extremely common. Here they occupy tunnels in the dikes between the rice paddies as well as in the stone piles alongside fields, and are probably a major factor in the control of rodents that feed on the crops.